We're just back from a month in Western Australia - near Perth - after visting our youngest son Dan and his family. We had a wonderful time but, with all the things we had to do and the interruptions of several birthdays and the Christmas festivities, the chances of fishing were few and far between. I did manage to wet a line a couple of times but caught nothing of any size. However, I did learn a fair bit about what I should have been doing and I'm certain that given a few days at it I'd get one or two decent fish. What I fancied catching was tailor and/or mulloway and although I ventured into one or two spots with good potential the times of day were rarely auspicious. Anyway, in case anyone else happens to be going out there I'll tell you what I did and what I discovered. From the word go I was fishing from first principles. I've caught a fair few tailor (alias bluefish) before so I knew what to expect. 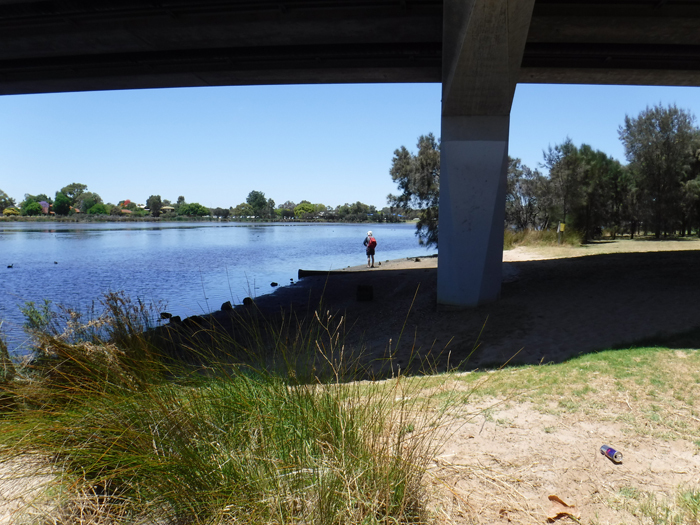 I had a couple of short spinning sessions from the shores of the Canning River near the city. 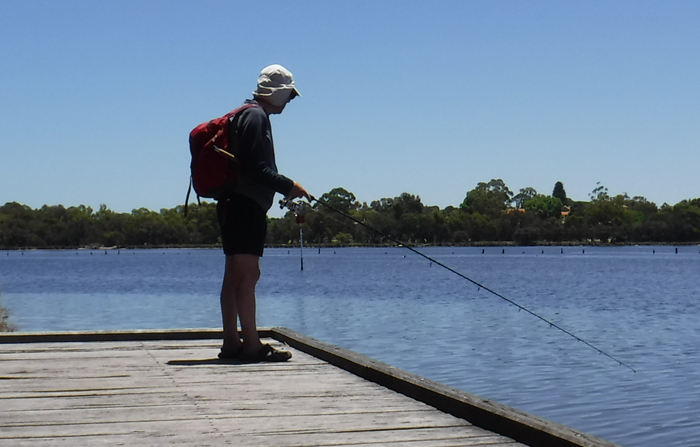 The estuary is wide and during the day it is usually packed with bathers, boaters, barbecuers and the like - so not ideal for fishing. On my first attempt I tried spinning in a couple of places as I walked along a mile or so of bank. Eventually, I found a spot where the boat channel came right in to the bank where I stood, and just as it was time to pack in (isn't it always? ), I managed a bite on a Mepps and landed the tiniest tailor in the world. I should really have used it as livebait for a mulloway but we had to leave. Of course I was keen to try it again. My next (and only other) attempt on the river was a different stretch. It was a perfect evening but the deep water channel was out of range and although I saw local anglers spinning with small lures neither they nor I caught anything. 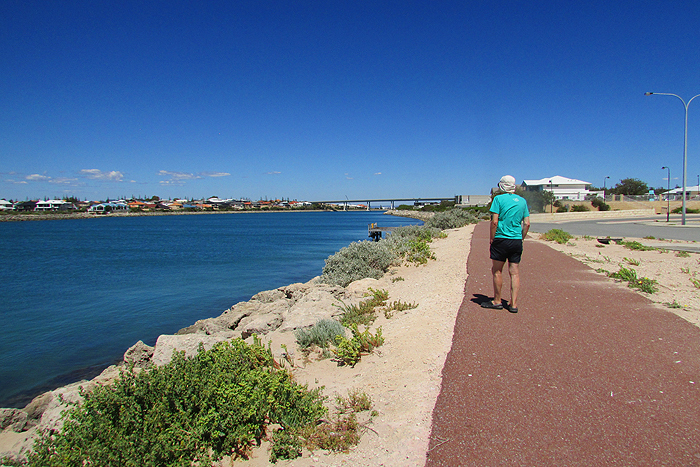 My next attempt was at a beautiful place called Mandurah where there is a huge, saltwater lagoon and lots of artificial canals and boat moorings. We spent a couple of days there with our inlaws, Richard and Julie, who had rented a house right on the sea. Needless to say as soon as we arrived I was down at the little harbour talking to some young lads who were fishing from the boardwalk. They were mostly catching the ubiquitous 'blowies' (puffer fish) on liny bits of bait but I noticed that they had a small, aerated bucket containing five fish of 'bait size'. I struck up a conversation and although they were a bit reluctant to talk at first, the fact that I was a 'Pom' and only there for one more day loosened their tongues a bit. I told them that I'd had a tiny tailor from the river and that it was my ambition to catch a mulloway. The small bait fish, it seemed, were trumpeters and they were intending to use them that evening for the purpose of catching exactly that. They invited me to go and watch them fishing. So I did! 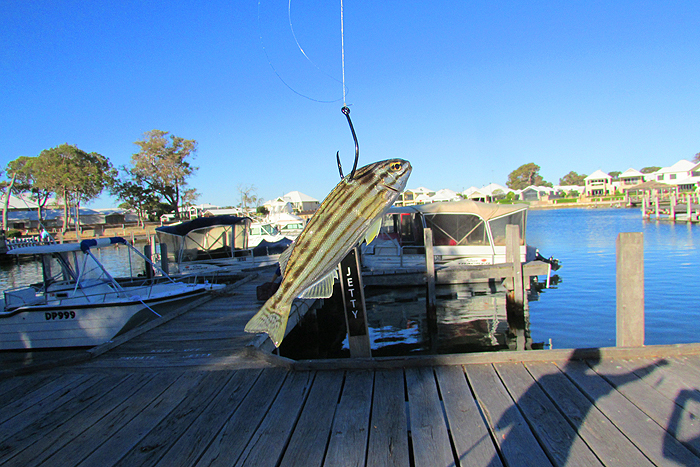 The impression I got was that the mulloway which they catch in the harbour are often smallish (up to about 60cm). The tactics used were interesting (to me). They all freelined the trumpeter livebaits on size 4/0 circle hooks. The baits were lightly impaled through the back, lowered to half-a-metre or so from the bottom (apparently the crabs have them if they're too near the sea bed). The spinning rods were then laid down with only the tips projecting beyond the decking and the checks set loose enough to allow a run from the predators. 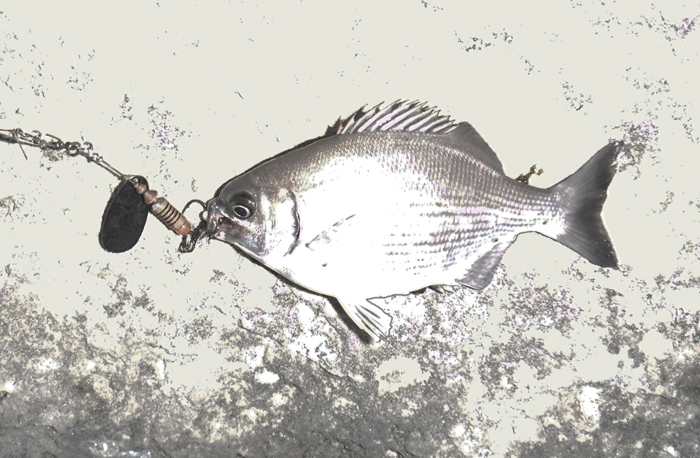 Sadly, on the evening that I was there they only had one bite which was missed (you can imagine that I was itching to try it myself), so I never actually saw one of the fabled mulloway, but I gathered that on a good evening it is possible to catch several using the tactics. Needless to say on the following morning I was down on the decking before first light. In the absence of livebaits I had to spin but it was a beautiful morning and I was quite optimistic. I'd only been fishing for perhaps five minutes when I heard a noise near the mouth of the little harbour. It sounded a bit like an asthmatic with a mouthful of water gasping for breath. I cast in the direction of the noise and over the next few minutes made my way towards the entrance (thinking it might be striking tailor). Several times the disturbance and snuffling was repeated before I realised that what I was hearing was a dolphin coming up for air as it hunted in the shallow water. Shortly afterwards a smaller dolphin, presumably the calf of the first one, came chugging out of the harbour and joined its mother. For the next fifteen minutes, as the sun began to rise, I watched them swirling and splashing as they tried to dislodge fish from the sea bed, often with their big, flat tails above the surface. Fantastic! My last attempt was when I went with Richard to fish "The Cut" a big artificial channel which has been cut to improve water exchange into the lagoon. Unfortunately it was the middle of a blazing hot day so the prospects were poor. Richard started off legering shrimps and didn't have a bite at all. I was spinning a Redgill and after seeing a few small fish following I switched to a Mepps which I baited with bits of shrimp. At least I caught a few fish on my improvised baited spoon. In all I landed five fish of four species. Two were baby bream, one juvenile wrasse, one banded sweep (identified for me by my e-pal Pete Liptrott) and a brown thing? which jumped out of my hand and back into the water before I could take its picture. The most interesting thing was that two blokes fishing at the mouth of The Cut appeared to be casting decent sized deadbaits into the strong current. We didn't have time to go and see what they were doing but I'm sure that dawn or dusk sessions with lures or livebaits from their vantage point would produce some decent fish. Perhaps the most striking thing about our stay was the brightness of the sunshine. I've quite often fished in the tropics but in WA I reckoned my sunglasses just weren't dark enough. The fishing, as you'll gather, was a bit like LRF - not my thing at all. Although it was in the heat of summer we saw lots of amazing birds and some spectacular flowering trees. Also the main object of the visit was, of course, to see our amazing grandchildren. Altogether it was an excellent holiday. 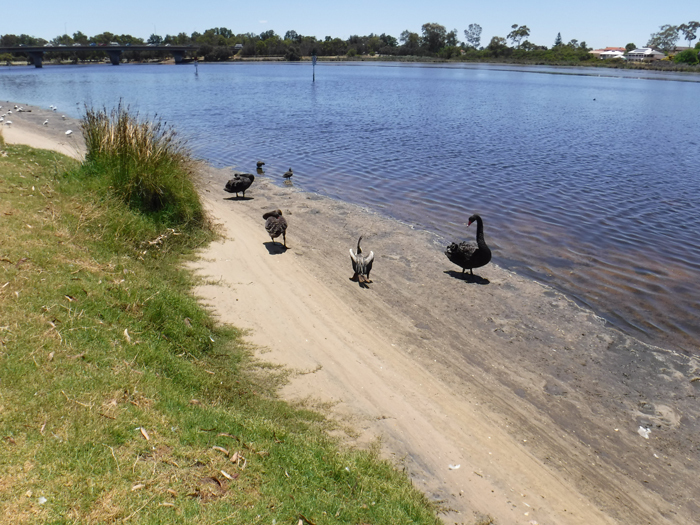 The canning river with black swans and a snake bird on the shore. Note the channel marker posts. Me spinning by a bridge - often a good spot. Me spinning from some staging. 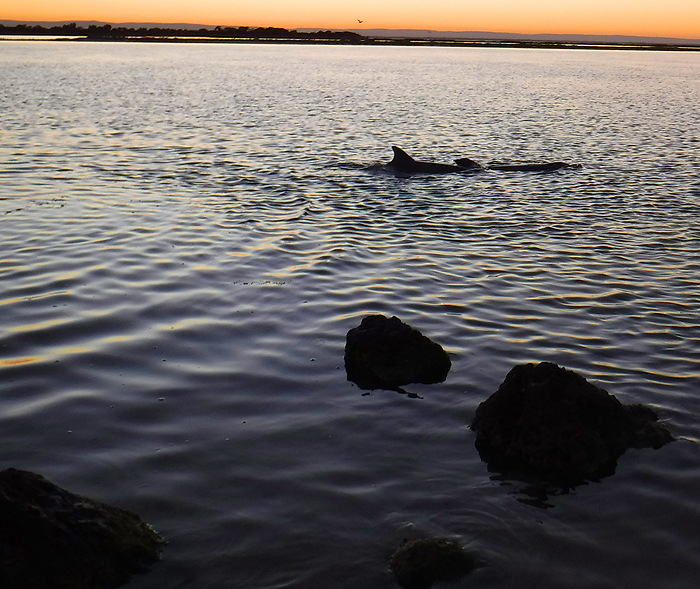 The dolphin family at Mandurah. 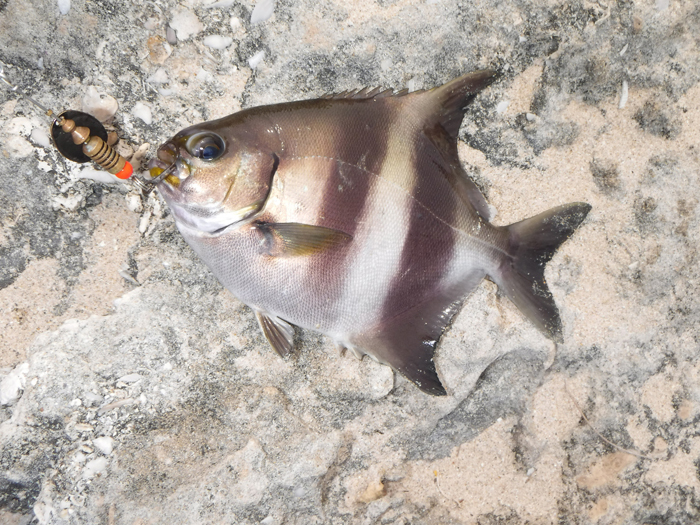 A trumpeter livebait ready for action. 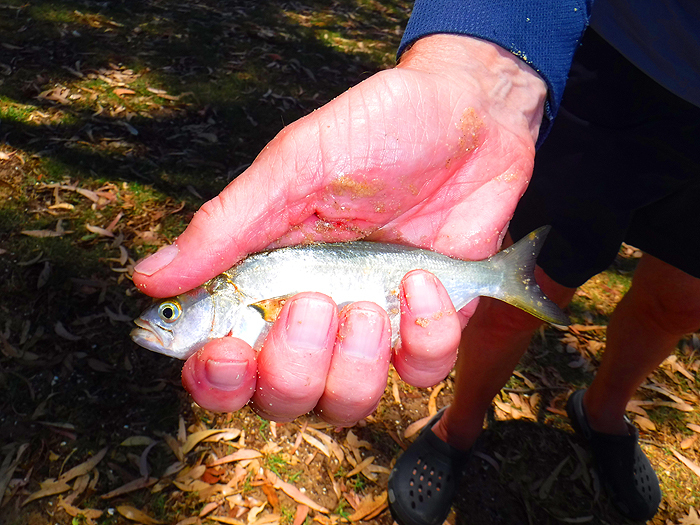 The Cut - easy fishing but I needed more time..
A nice silvery baby bream. The picture was bleached by the bright sunshine. A tiny but nicely marked wrasse. The sweep - a nice hunky little fish.